castle which stands on the small hill. The large rooms, the several facilities, the wide range of activities and the proximity to the sea... are certainly favorably elements for a couple as well as a family holiday. 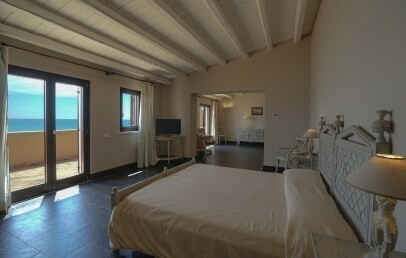 The Falconara Resort is situated on the south eastern coast of Sicily in Marina di Butera in a wonderful panoramic position, between Gela and Licata, dominating the sea. The Medieval Castle of Falconara, close to the Resort, enhances its charm with a magical atmosphere that brings back to ancient times. The ariport Catania is approx. 160 km distance and the airport Palermo approx. 210 km. The Resort was built in a territory where in the past Castle farmers used to have their houses. The central building of Falconara Resort, called “Club House”, 200 m from the sea and it has all the main services of the Resort as the reception, the bar, the restaurant and most of the rooms. The other building, called “La Fattoria”, was the ancient Castle outbuilding for the servants. The building has been completely renovated and it has different rooms’ categories. The part of “La Fattoria” recalls the ancient castles, though revisited in a very original and modern way. All rooms have a flat screen TV with satellite channels, safety box, air conditioning, frigo-bar, bath with tub (some with shower), hairdryer, balcony or patio equipped with table and chairs. The accommodations of the Club House, central building, are characterized of bright and comfortable rooms. The rooms are located either on the ground floor or on the upper floor, with garden or sea view (supplement). The Classic rooms are for 2-3 people and the Junior Suites are a bit larger and offer the possibility to add a third or fourth bed in the living corner. 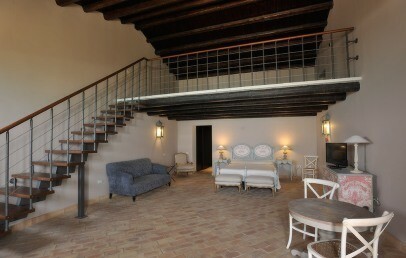 The accommodations of the Fattoria, an ancient and fascinating dependence of the Falconara Castle, are characterized by a Sicilian-style décor of charm. The Superior rooms for 2-4 people, are located on the ground floor with garden view with 2 queen-size beds or double bedrooms with sea view (with extra charge). The Suites for 3-4 people, are located on the ground floor or on the first floor, garden or sea view (supplement). They are composed of a bedroom and the possibility to add a third and fourth bed in the living area. Some Suites are arranged on two levels with 2 double beds and 2 extra beds located on the lower level. 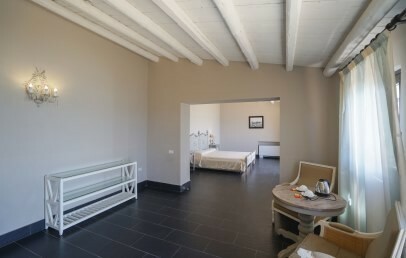 Guests staying in the Suites of the Fattoria are entitled to the evening turndown, top toiletries set, bathrobe, slippers, tea and coffee making facilities in the room. For guests of Falconara Resort a private beach area is reserved, equipped with umbrellas and sun beds (no reservation possible). AT the Club Hous is the wellness centre with oriental touch "Sabai Dee Spa", dedicated to guests of Falconara Resort who wish to take a break and regenerate. The centre has a design furnishing with spacious and welcoming treatment cabins. It offers a sauna, a bio sauna, a Turkish bath, chromotherapy showers, massage rooms, relaxation area with choice of herbal teas, boutique, a "Remise en Forme" service designed for every need. The Hotel offers a program of fun, sports and wellness. After dinner, the evenings continue with musical entertainment and surprise guests. Buffet for breakfast, lunch and dinner with buffet of appetizers, side dishes and desserts, first and second served at the table with choice from a small menu. The restaurant serves traditional Sicilian specialties and national cuisine. For guests with food intolerances (gluten/dairy) are packaged basic products available (bread, pasta, gluten-free and / or dairy-free biscuits, dairy-free ice cream); customers can integrate everything with products supplied by themselves. Reporting is required by booking. The Club Card includes the beach service with 1 umbrella and 2 sun loungers per room (not reserved; gazebo excluded), use of the swimming pool, fitness room, tennis field during the day. Wi-Fi connection is available free of charge in common areas. Services at a supplement are room service from 07:00 to 24:00, baby sitter, laundry. City tax of € 2,00 per person/overnight, for the first 10 overnights of the stay and for everyone older than 11 years. During July and August the tax is € 3,00 per person/overnight. The tax has to be paid directly on-site. Bright double bedroom located either on the ground floor with an equipped patio or n the first floor with an equipped balcony (table and chairs). Both have view on the nice garden and all are tastefully decorated. The bathroom has a tub, hairdryer. Bright double bedroom on the first floor. They are tastefully decorated. The bathroom has a tub, hairdryer. From the balcony can be enjoyed a nice sea view. Balcony is equipped with a table and chairs. They are furnished in a classy mix of modern and classic style, with black and brown colors that create a warm and welcoming environment. They have a bedroom and a living corner. The bathroom has tub or shower and hairdryer. 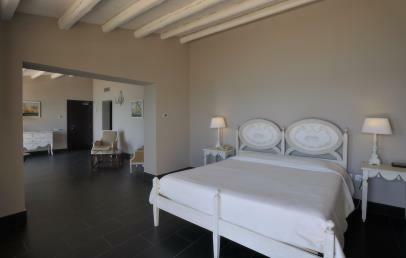 Inviting and cozy double rooms located in the historical area of the Resort. They have 2 queen-size beds. The bathroom has a tub and hairdryer. The rooms have a lovely patio or balcony with garden view. This room type can accommodate up to 2 adults + 2 children under 12 years. 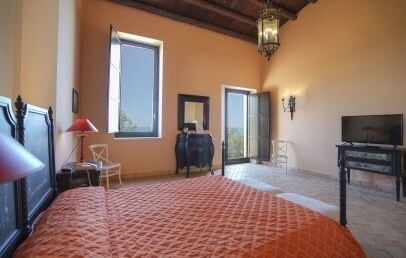 Inviting and cozy double rooms located in the historical area of the Resort. They are carefully furnished and have a double bed. The bathroom has a tub and hairdryer. The rooms have a lovely equipped patio or balcony with nice sea view. Spacious Suite, every Suite with their own beauty. They are located either on the ground floor or on the first floor. They all are characterized by a Sicilian-style décor of charm creating a cozy and classy atmosphere. They have a bedroom with a comfortable living room (possibility of adding 3rd and 4th bed). Some Suite have an upper floor with a spiral or normal staircase. The bathroom has tub or shower and hairdryer. The Suites have a furnished patio or balcony and offer garden view. Spacious Suite, every Suite with their own beauty. They are located either on the ground floor or on the first floor. They all are characterized by a Sicilian-style décor of charm creating a cozy and classy atmosphere. They have a bedroom with a comfortable living room (possibility of adding 3rd and 4th bed). Some Suite have an upper floor with a spiral or normal staircase. The bathroom has tub or shower and hairdryer. The Suites have a furnished patio or balcony and offer sea view. Book within April 30th 2019 and get a 15% discount on your stay.